Bremer Chiropractic started out as Maxwell Chiropractic Clinic in the early 1980s and has been serving the Ipswich community for over 30 years now. Our practice was located at 19 South Street and 5 Murphy Street before moving to the current location near Raceview. We have seen many well known chiropractors build our solid reputation including Dr. Nick McKendry and Dr. Lyndall Daley. 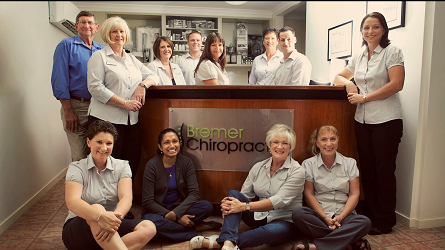 Today, Bremer has grown to four chiropractors and four massage therapists ,making us one of the largest and most diverse chiropractic clinics in Ipswich. Our clients benefit from both male and female practitioners with a range of qualifications and experiences. We treat anyone who walks through our doors just like we would our own family. We want you to experience cutting edge, evidenced based care while enjoying a fun, family friendly and positive environment. We believe that your body is an amazing self-healing and self-regulating organism that was designed to express optimal health. Our job, as natural healthcare providers, is to remove any interference to that expression without the use of drugs or surgery. If this sounds like what you are looking for, we look forward to seeing you in our office.